Have you ever missed an important meeting or event because you were engulfed in an extreme iOS gaming session? If so you may have contracted iOS-gaming-syndrome and we prescribe the Gamer Cydia tweak.What the Gamer Cydia tweak will do is show an alert after you have played a game for X minutes. After the pre-set time is up a dialog box will pop-up asking you whether or not you want to continue your gaming session (essentially a snooze button), or close the game and continue on with your day. 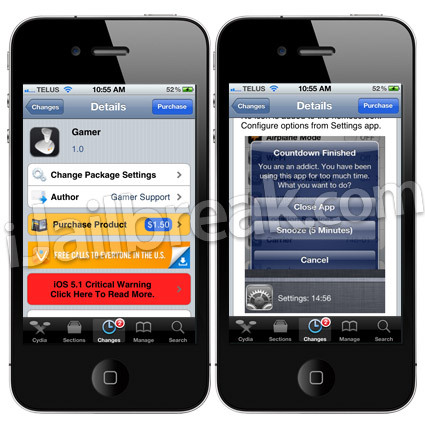 The Gamer Cydia tweak has many configurable options and if you are on the iOS 5 firmware generation you will be able to take advantage of built-in notification center functionality. There is even an SBSettings toggle included to disable the tweak with ease.